Evaluating your overall wellness and setting new goals is something that can linger on your to-do list indefinitely. While you might want to make a change, figuring out how to get from where you are to where you want to be can be such a challenge that it’s tempting to give up before even getting started. Here are ten easy to accomplish tips that will help you move forward in your goal to live a happier, healthier life. Don’t be afraid to imagine big. Imagine the best daily experience, long-term goals, and overall sense of wellbeing possible. Break down that long-term vision into smaller, accomplishable tasks. For example, if you want to be less stressed after work, determine the specific changes that will have to happen (keep your laptop in your bag, turn off the email function on your phone, return work calls on your own schedule, if at all…) The point is to articulate a clear ultimate objective and outline the required steps to get there. Take an honest look at where you are. Speak with people around you. What do they see as your biggest challenges? What are the most common complaints they hear from you? What concerns them about your health and happiness? Listen to their insight. It might open you up to a new perspective, revealing previously unseen wellness changes that can populate your list. Setting realistic goals is a critical step on the path of accomplishment. When you establish goals that are difficult to meet, you set yourself up for to fall short, which is both disappointing and demoralizing. Work with a fitness trainer and nutritionist to determine healthy, realistic, achievable weight loss and fitness goals for you. Be honest about your lifestyle, likes and dislikes, cravings, patterns and weaknesses. This information will help you set objectives that you can live up to, which will build your momentum. Gain a greater understanding of the challenges your body faces on the path to wellness. Blood work can make you aware of cholesterol, blood sugar, hormonal and metabolism imbalances that you might be unaware of. Equipped with this information, you and your doctor can determine the correct combination of lifestyle and medication (if necessary) to help you move toward optimal health. It’s tempting to try to make major lifestyle changes alone. Read a few articles online, draft a new diet plan and dust off that gym membership…sounds easy, right? While it sounds simple in theory, lasting change requires knowledge combined with action. 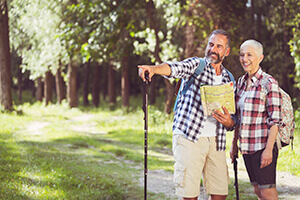 Trained professionals have the experience and expertise to guide you in the right direction, based on your own unique set of physical and lifestyle challenges. Speak with a physician about your weight. Work with a personal trainer for your fitness. Visit a wellness retreat to learn more about your body’s functioning as a complete system. Empower yourself by partnering with experts who prioritize your wellbeing and can support you along the way. We’ve mentioned it before, but we’ll say it again: a healthy lifestyle is an ongoing commitment. It’s a perpetual flow of choices. Stop allowing yourself to delay your quest for better health. There’s no reason to wait until Monday/the first of the month/your birthday/or any other date or time. If you want to make the change, there is no better time than right now. It’s too easy to let yourself off the hook when the going gets tough. Share your goals with a trusted friend who inspires and motivates you. Or, post your objectives and progress on social media. Be honest about your weaknesses ahead of time, so your friends and supporters can gently guide you back onto the path when you start to stray. Going public with your aspirations can be a major asset in transforming your goals into reality. Measuring your progress helps you see how far you’ve come, and reminds you that you’re moving forward, even if it appears otherwise. Give yourself a pat on the back for small gains. Praise yourself for that trip to the gym, for NOT indulging in your craving, and for choosing to eat healthy (even when it’s inconvenient). Weigh yourself at intervals that make sense (ex. weekly, not daily). Don’t go crazy measuring the minutiae, but be sure to congratulate yourself on your successes. Register for a fitness activity. Sometimes the most effective goals are the ones with a calendar date attached. Register for a marathon, walk-a-thon, mud run, bike ride, wellness retreat or any other activity that gets you excited about your own health and fitness. Shake off the restraints of your personal patterns and climb out of the rut of the ordinary by injecting some fun (and possibly friendly competition) into your wellness goals. Many wellness limitations have causes that are entirely non-physical. Trained counselors and therapists can help you uncover unhealthy mental patterns that manifest themselves in your physical and mental wellbeing. For the best chance of success, look for a counselor with a philosophy and approach that resonates with your own belief system. Evaluating your wellness and setting new goals requires you to take an honest look at where you are and where you want to end up. With the right mixture of support, encouragement, expertise, and enthusiasm, no goal is beyond your reach. To learn more about how VeraVia can help you set new wellness goals, request more information today. This entry was posted in Body & Hygienic Care, Health & Wellness, Weight Loss. Bookmark the permalink.